Sure, there are plenty of apps you can use in education. There are even apps created specifically for use in education. Apple has a whole category dedicated to education in the App store. But how do you really know which ones are worth downloading, or possibly even paying for? MindConnex management team (L-R): Fergus Connolly, COO; Michael Cordner, CEO; Paul Kerley, non-executive director (former CEO of Norkom Technologies); Fiona McLoughlin, Director of Marketing; Jer McAuliffe, Creative Director. 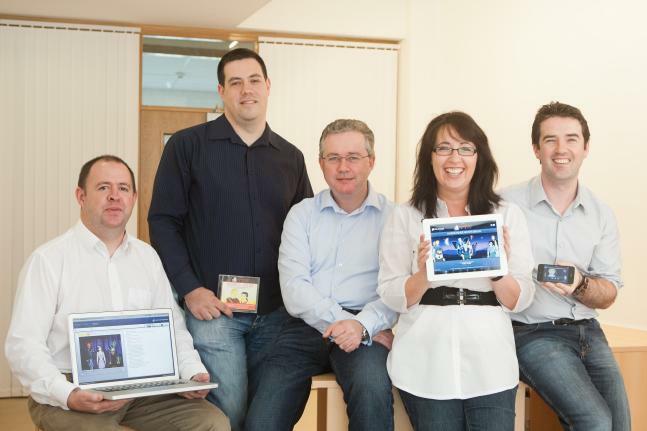 With the continued trend towards digital education, Irish start-up, MindConnex Learning, is ideally poised to break new ground with its digital learning solutions aimed at the global secondary/high school education sector. The company’s award-winning flagship product, Shakespeare In Bits, brings the Bard to life in the classroom through a multimedia approach that fuses animation, high quality audio and full, unabridged text for each play. Modern day translations of key words and phrases are accessible at a click of a button, and in-depth notes and analyses are also available. Each character is provided with a biography, while an illustrated map shows all characters and their inter-relationships in the play. According to CEO, Michael Cordner, “Up to 65 million students across the world study Shakespeare every year and, while there is a lot of beauty, humour and relevance in all of Shakespeare’s works, the language barrier can be insurmountable for some of these students. Shakespeare’s plays were never intended to be merely read – they were written to be performed. What we’re trying to do is to make this 400-year old literature more engaging, more easily understood and far more accessible using today’s technologies”. Dear couples from all over the world! Are you ready for the February 14th this year? If not, iPads House is here to share more ideas on what you can do on this amazing day. You can start from discovering new Best Valentine’s Day iPad Apps (Part 2) and Best Valentine’s Day iPad Apps (Part 1), and Free Romantic iPad Apps for Valentine’s Day. If you have most of those applications and games on your gadgets, we will offer you another list of great programs for your iPad. These applications aren’t free. But maybe you’ll enjoy getting some of them from iTunes anyway. 1. Shakespeare in Bits: Romeo & Juliet iPad Edition is worth $14.99. It’s a great app for those who are in love with the timeless story of love created by Shakespeare. It’s the tragedy and revenge of Romeo & Juliet. This education app for iPad features the voices of Michael Sheen and Kate Beckinsale. You’ll get 3 hours of text and high-resolution animation while you read, listen or view Shakespeare in Bits. It’s a chance to experience the world’s masterpiece in all its glory. Shakespeare’s language is very rich. You can understand it as you’ll get acquainted with the original play text which was broken into bits for easy digesting. Besides, you’ll see in-line translation which makes hard words and phrases so easy to understand. This romantic iPad app for Valentine’s Day allows you highlighting words and lines, simplifies navigation options, and lets you jump to scenes of your choice.